If you are shopping for a fireplace insert, then you’ve come to the right place! 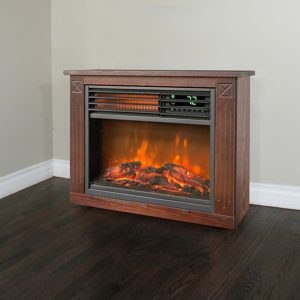 On this page, we review and compare the 8 best-rated fireplace inserts sold online in 2019. 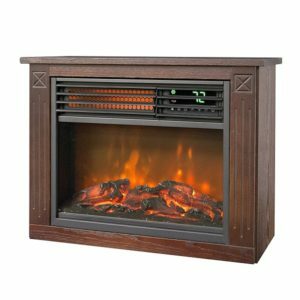 Our top picks are based on our extensive review of electric fireplace insert reviews by 100s of verified owners on Amazon and on other retail sites. 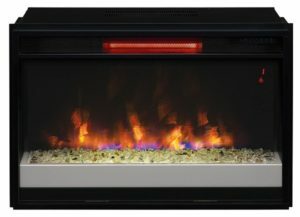 Read our introductory guide to fireplace insert shopping to learn more about choosing the best electric fireplace insert for your home. When Should You Buy a Fireplace Insert? 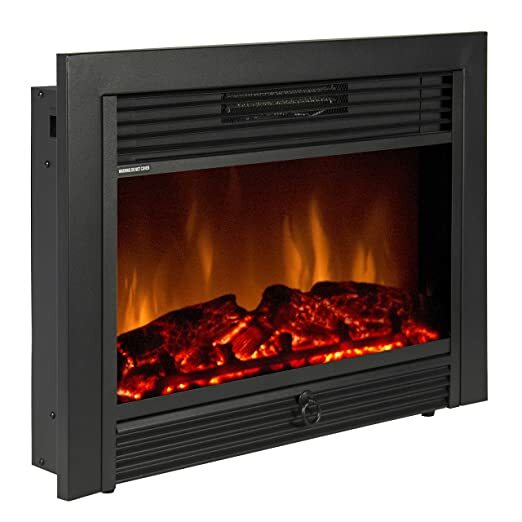 Dimplex DFI2310 Deluxe Electric Fireplace Insert 23"
Best Choice Products SKY1826 Electric Insert Heater 28.5"
Dimplex DFI2309 Electric Fireplace Insert 23"
With jet-black framing and a glass front, this fireplace insert is perfect for adding a modern touch to any décor. The flat design combined with the black framing and the silver tray at the bottom creates a sleek contemporary look that looks great in any room. It works perfectly with modern décor homes and can also be installed in traditional or farmhouse stylehomes. This unit is designed to not stand out, but to become part of your wall, while enhancing the look and ambience of the embers and flames inside it. 5,200 BTU heating capacity. With the press of a button, you can supplement the cozy ambience with some warmth. The 5,200 BTU heater in the fireplace inserts easily warms up a mid-sized room. You can turn down your thermostat when it’s on and save a significant amount of energy. Numerous flame effects. With five flame colors, five brightness settings and five flame speed settings, there are plenty of ways you can create your unique effects. Specifically, 125 ways. For instance, you can set a midnight fire flame color, with dim brightness settings and a low flame speed for the perfect camping aura. Produces infrared heat. This heat helps maintain ideal moisture levels in the air. It doesn’t have a drying effect. Easy-use remote control. 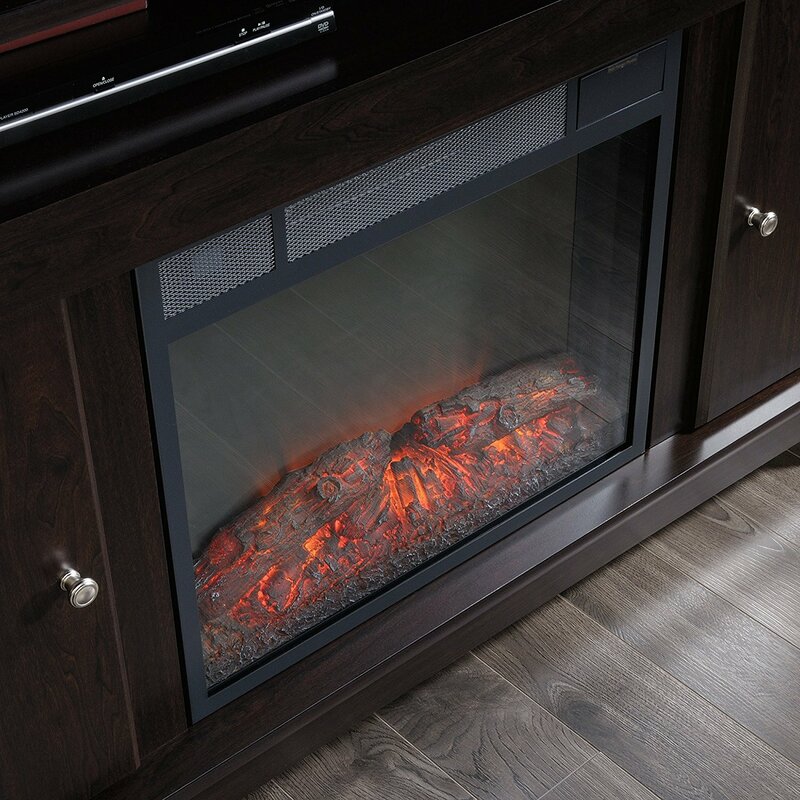 This ClassicFlame insert comes with a multifunction remote control with which you can change flame settings from the comfort of your couch. You can change temperature, adjust flame color and speed and turn the heat on or off. Includes a safe plug for over-heating protection. The plug continually monitors how hot the fireplace insert is. If it goes beyond a certain temperature, the plug shuts it down automatically until it has cooled down. Many customers love that this fireplace insert is able to heat a room well enough for them to turn down their main heating system. Many noted a reduction in their gas and electricity bills. Regarding style, most customers agree that this is not the most realistic looking flame, but it looks beautiful. The flame and embers create a homely peaceful ambience. Now, if only the embers could crackle and snap. But at least there is no motor humming to remind you that it is not an actual fireplace. It runs very quietly. Many users report that installation is very easy. There is no need to call a pro or spend hours tinkering with it. Spend about a half an hour or so, and you can start enjoying the new look and warmth of this great fireplace insert. If you prefer a more rustic look in your fireplace, this is the best choice. 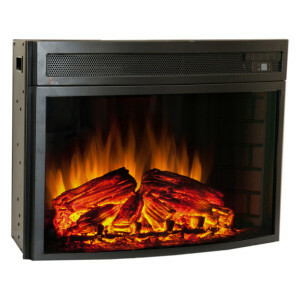 It is an electric fireplace insert with heater and highly realistic flame effects. The most appealing part of the design is the faux brick interior. It makes the insert look almost like a real built-in fireplace. A tempered glass panel and black framing balance the traditional look with some modern touch for better blending in all kinds of decors. The logs are bigger than in the ClassicFlame 26II310GRG-201 mentioned above. They look like actual burning logs. The flame itself is very realistic. Again, the only thing missing is some crackling and snapping of burning embers. Dual voltage. 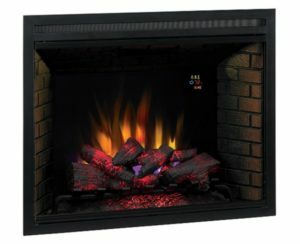 This fireplace insert can be connected to either a 120V or 240V power system. This comes in handy if you don’t have a standard 120V outlet at your home or if you are planning to use it in a country with a different power standard. Powerful heater. If you are looking for an insert to enhance your home’s feel and keep it warm too, this is one best electric fireplace insert. It uses a blower fan to spread the heat evenly across a 400-800 square feet room. You can even turn down your AC when it’s on, saving you some energy. Realistic log and ember bed. This is as real as it gets without putting in actual logs. This insert uses a pulsating ember bed and traditional-style logs to make you feel like you have a real fireplace in the room. According to some users, the realistic design manages to fool everyone from pets to neighbors. Multi-function remote. With the remote control, you can set the ambiance and temperature you want without getting up. You can change the brightness level and the amount of heat produced by the heater. Most customers say the heating capability is the best part of this insert. It easily warms up a large room even in the coldest winter weather. Many also love the realistic look of the embers, logs, and flames. They say it makes them feel like they own an actual fireplace without of course the hassles of having one. The remote is also a big plus for many users although some point out that it’s not possible to turn the heat on or off from the remote. You have to press a button on the insert, which is tedious especially since you have to open the insert’s door to reach the button. The design of this insert is elegant and sleek yet warm and traditional. The insert is set inside a dark oak cabinet and mantel. So you don’t need to install it in a fireplace or cabinet. It looks perfect all on its own. The top section of the insert where the vents and the display screen are has been enhanced with modern-looking grills. The whole setup looks so real. Few people seeing it for the first time will doubt it’s a real fireplace. Powerful heater. This is one of the most powerful inserts in our top picks when it comes to heating capability. With a 5,100-BTU capacity, it can easily heat a 1,000 square feet room. Many users were surprised at just how much heat it produces. Many say they have to turn it off after some time because of too much heat. Infrared heat. Instead of the usual fan-blown heat produced by most inserts, this one gives off infrared heat. The advantage of infrared heat is that it does not dry up the hair, ensuring the room remains comfortable. Cabinet and mantel. As I mentioned, this insert comes with its dark oak cabinet and mantel. All you need to do is find a place to stand it. No installation is necessary. You can even place a vase on the mantel to complete the stylish look. It includes a remote to set the temperature, choose the flame effect and switch the heat function on or off. The common sentiment was that the insert is smaller than most people expected. But it is beautiful all the same, especially with the cabinet and mantel. Many customers also commented on the amount of heat it produces, enough to heat a large room. There is no need to use your AC when you have the heater on. Most users found the installation to be easy and quick. This insert is all-black, making it easy to match it with your existing home décor. It easily melts into your fireplace, making sure that only the flaming logs inside are noticed. The general design is modern although with an industrial touch to it. But don’t worry; it works perfectly in any décor. Realistic flame. The insert uses a patented technology to create a realistic flame effect. If there were some crackling to accompany the flames, no one would doubt that you have a real fireplace. Hand-painted logs and pulsating embers. No wonder the logs look so real. They are meticulously hand-painted to resemble wooden logs. The ember bed pulsates to make it seem like it’s burning red hot. Three heat settings. You can set the heat to full, half or none depending on the weather and season. Many customers were taken aback by how real the logs and flame look. Many say they expected a somewhat realistic look but not something that looks exactly like actual logs. If you look through the reviews, there are plenty of stories of kids, neighbors, pets and visiting family thinking it was a real fireplace. The only complaint is that the heat is not as strong especially if you install the insert in a large room. A fireplace insert is great when you want the feel and look of real wood or gas fireplace but without installing one. Maintaining a real fireplace is a lot of work – not to mention, expensive. A fireplace insert gets you that fireplace you always wanted without the extra work or costs. I also recommend a fireplace insert if you are looking for a simple but effective way to enhance a room. It will make the room feel warmer, cozier and more homely. The ideal heating capacity depends on whether you want an insert for just decoration or also as a space heater. If it’s for decoration, the heat capacity doesn’t matter. You can even get one without a heater. If you want an insert for heating your room, look for an insert that can heat a space of at least 400 square feet. For larger rooms, buy an insert with an infrared heater that can heat a room of up to 1,000 square feet. The best style depends on your tastes and your home’s existing décor. Traditional inserts have very realistic logs and brick or wood finishes. Modern inserts have a flat, minimalist design with a glass front and black finishing. Some inserts combine both traditional and modern aesthetics for a more balanced look. 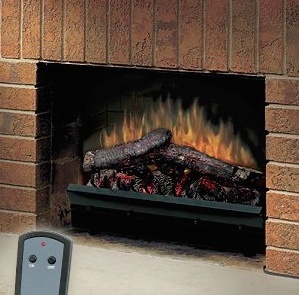 There are three types of fireplace inserts: electric log, plug-in, and built-in. 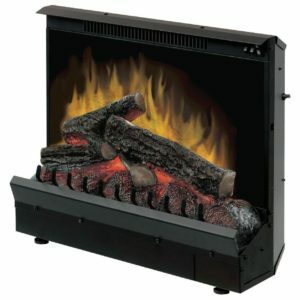 An electric log insert consists of a grate with faux logs and embers. You simply insert it in an existing wood or gas fireplace. 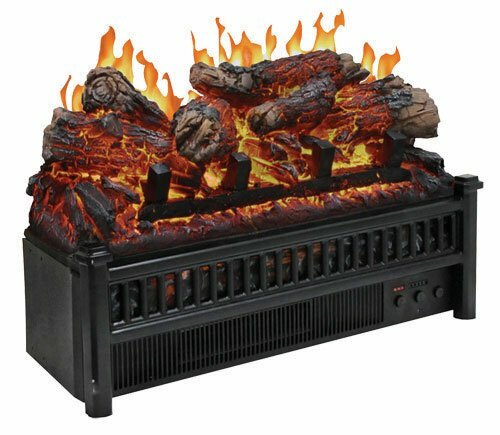 A plug-in insert is a self-contained unit with heating, an ember bed, and realistic flame effects. It can be inserted into an existing fireplace or recessed into a cabinet. A built-in insert requires a builder’s box to install it into a fireplace. The installation is permanent. Make sure you measure your fireplace (or wherever you will install the insert) to make sure the unit fits. Take measurements of the width, height, and depth of the opening. If you can’t find an insert with the same measurements, buy a slightly smaller one than your opening dimensions call for. It’s easier to make modifications to fit a small insert into an opening. A larger insert will not go in unless you make some major and expensive changes. To enhance their style, some inserts come with special trim finishings. Some use different materials like cast iron while other simply paint the flashing a different color like silver. You can also buy an insert with an ordinary trim and then have a fabricator or carpenter create a custom metal or wood trimming. Finally, look for extra features that make the insert easier to use and enhance its look. A remote control is a must. I don’t think you want to keep standing up to press buttons on the insert whenever you want to change a setting. Most inserts also come with multiple flame effects such as colors, brightness, and speed. Other additional features to look for include timer settings, screen display, and crackling sound effects.